The first confirmed case of Ebola to be contracted outside of Africa has been confirmed this week in Spain. A nurse, Teresa Romero Ramos, is being monitored in a hospital in Madrid after testing positive for the virus despite showing no symptoms of having Ebola. The Spanish authorities are facing a battle to contain the virus with the nurse suspected to have contracted Ebola while treating 2 Spanish missionaries who recently contracted the virus while in Africa. They have both been quarantined along with a second health worker who has a fever and diarrhoea. Doctors have prescribed the nurse a series of antiviral medication as well as antibodies from an Ebola survivor. As part of a wider effort to contain the spread of the deadly virus, more than 50 medical Spanish staff are being monitored for any symptoms that they may exhibit. The World Health Organisation has insisted that Europe is likely to see a large number of further cases of Ebola. The nurse's husband Javier Limon Romero has also been quarantined and is currently in an isolation unit. He is fighting to save the life of the couple's dog, Excalibur, after health authorities sought to have it euthanised. He has claimed that health officials gave him an ultimatum regarding the family pet saying "If I do not give my consent, they will seek a court order and go into the house by force to kill the dog". Romero insists that the dog cannot possibly be infected with Ebola and therefore there is no grounds to put it down. The dog is now at the family home where Romero said he has left "a bathtub with water and left out 15kg of feed". He has launched an online petition to try and spare the dog's life and so far it has received over 150,000 signatures of support. 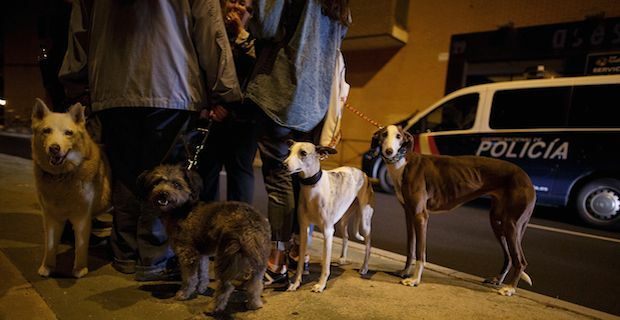 The campaign has been mainly gathering pace through Twitter through #SalvemosAExcalibur which translates as Let's save Excalibur and protestors have come out in force with their dogs in tow.